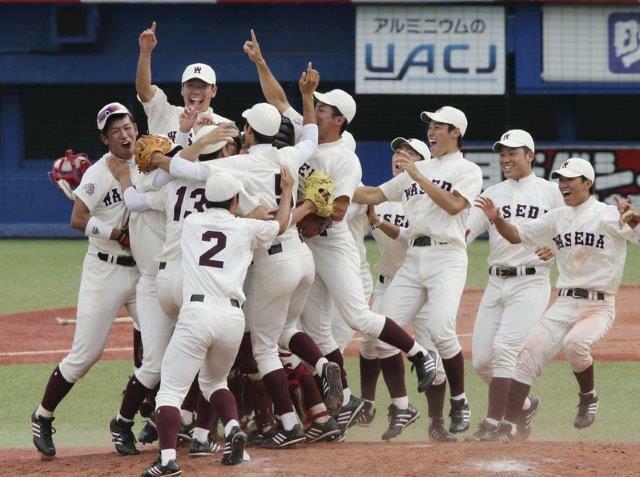 The Yomiuri Shimbun　Waseda University celebrates its victory after the final out on Sunday. With its latest late-inning outburst, Waseda University captured its fifth Japan national college baseball title, while denying Ryutsu Keizai University a first-ever crown. Kazunari Ishii singled in two runs in a five-run seventh inning, then added a two-run homer in the ninth as Waseda defeated Ryutsu Keizai 8-5 in the final Sunday at Jingu Stadium. Waseda, which trailed 3-1 through six innings, had not been expected to contest for the title after losing several top players to the pros, including Hokkaido Nippon Ham pitcher Kohei Arihara and Chiba Lotte Marines infielder Shogo Nakamura, prior to the spring. But a never-say-die attitude saw the team win the Tokyo Big 6 League with a perfect record. In 12 games, Waseda scored 68 runs — more than half (36) of which came in the seventh inning or later. “It’s our strong point that we battle with the spirit that we never want to lose and we can always rally to victory,” captain Ukyo Kawahara said. Waseda’s Eigoro Mogi, who batted over .600 and hit two homers, was named the tournament Most Valuable Player.